Yesterday, Olumide Onadipe opened at Temple Muse an exhibition of his recent works titled ¨Connecting the dots¨ and organized by SMO Contemporary. Olumide continues evolving and maturing an artist. Though he started his professional career producing realistic paintings, in recent years, he has experimented with plastics and other media to produce sculptural pieces of profound quality, meaning and beauty. 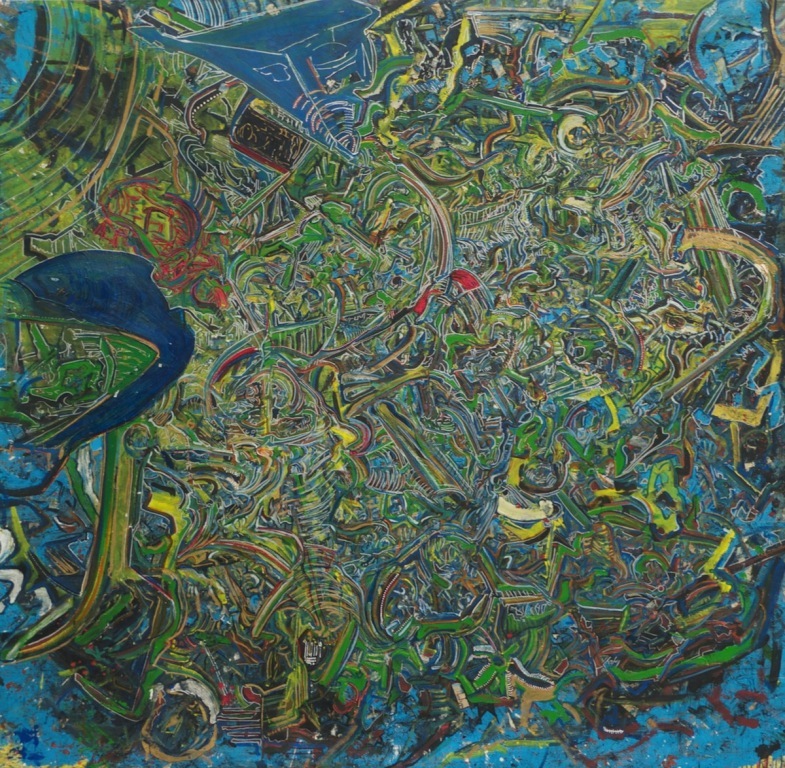 For those of us who have followed him for more than a decade, his new works do not present themselves as a surprise or a rupture, but as an evolution and deepening of ideas and formal solutions that are gradually developing as Olumide grows as an artist. He is a versatile artist comfortable with different types of media, so in “Connecting the dots”, Olumide, presents two distinct bodies of work: paintings and sculptures. He initiated his artistic practice as a two-dimensional painter. Then, around 2008, he started rendering abstracted faces and figures masked with vegetation. Ten years later, in his paintings, leafs continue being a recurrent compositional element, but his vocabulary has expanded and the works have acquired a greater complexity and a deeper meaning. Nevertheless, the present exhibition shows that while his roots are still in painting, and some of the sculptural works retain a distinct pictorial character. 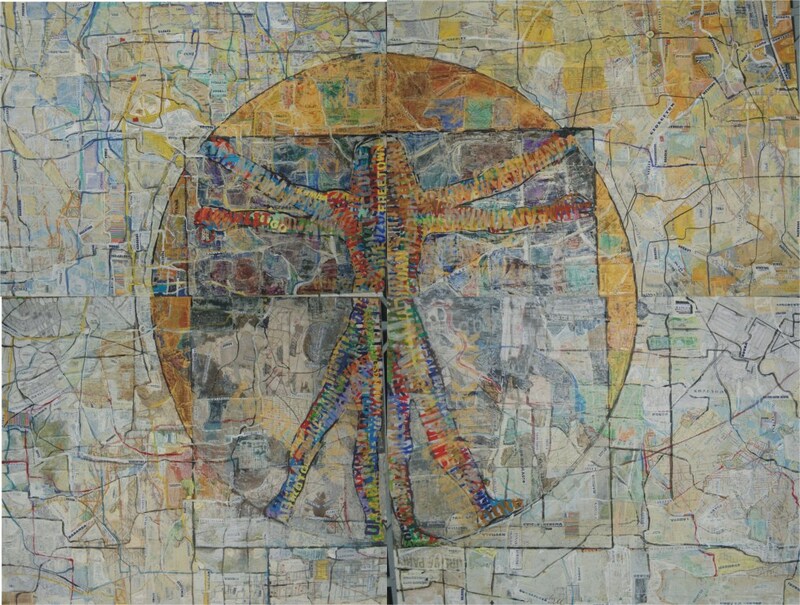 His artistic identity is increasingly defined by his experimentation with plastics, paper, newsprint, cement bags, and other materials. 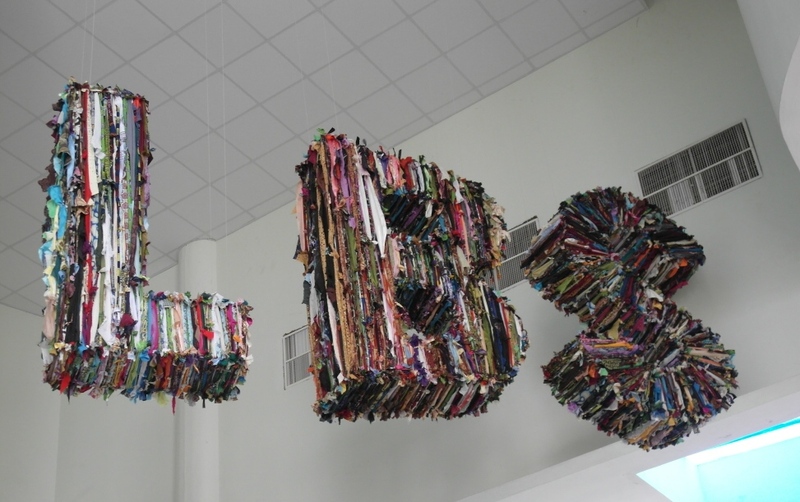 Olumide has always acknowledged the great impact Kainebi Osahenye’s exhibition titled “Trashing” had on him in 2009. It was a discovery. As he says speaking about that exhibition: “It switched on my inner light and became a guiding compass to what now characterized my artistic pursuit.” But, while his first works using melted plastics were tentative and, perhaps a little bit uncertain, the recent ones are much more assertive. Olumide is finding an aesthetic vocabulary and a formal language that allow him work with ideas and meanings in a much more forceful way. Gradually, Olumide is mastering the primary elements of sculptural artworks: volume and line, weight and mass, shape and texture, solidity and flimsiness, emptiness and fill, roughness and smoothness, order and improvisation, colour and form. But, perhaps, the defining feature of these sculptural works is the fact that they are generally made of countless small units –each one similar, but each one different from the others- put together into a single piece. In this, he is not far from the work of some prominent contemporary artists in Nigeria: El Anatsui, Olu Amoda, Kainebi Osahenye, Eva Obodo. When Olumide refers to his sculptural works he presents a narrative with allusions to socio-political issues. But these physical commentaries on events, social customs and malaises that affect Nigerian society are rarely explicit. In most cases, they vaguely suggest something through their form. In a few others, it is only the title of the work that opens the door to possible interpretations and readings by the viewer. Olumide is well aware of the difficulty of embedding meaning into a non-representational sculptural form. Nevertheless, since he started painting, he has been very much concerned about meaning and communication. The impenetrability and inherent muteness of matter are a challenge he takes head on with the hope that his works will, eventually, be able to relate, to communicate to both, the body and the mind of the spectator. Generally, he does not work with untouched materials and there is heavy labour involved in the process of producing each of his sculptural works. Through physical and mechanical processes of breaking, melting, rolling, folding, wrapping, tying, welding and aggregating, the common materials retrieved and used by Olumide acquire a new life in his works. In his work titled “Pyramid scheme” Olumide takes his aim at the fraudulent financial schemes, unfortunately, so common in the country in past years, taking money from the poor to give it to the rich schemers. The works in his “leg series” are about the movement of ideas, people and objects into and from the African continent. About those who came –and continue coming- and about those who left the continent and took with them part of it. The “legs”, in Olumide’s recent works are a powerful metaphor for change, for transitions and trade. The physicality of these pieces is such that the first response to the encounter with them cannot but be intuitive –perhaps, I should say, instinctive. Then, there might be a complex process of perception, assimilation and rationalization of the narrative that permeates these works or, perhaps, the work may remain silent, incapable of conveying what the information we receive is supposed to tell us. In either case, the first response is almost instinctive. With the works of many artists, it is possible to remain indifferent, untouched and removed. In the most successful works in this exhibition, this is not generally the case. They talk to us forcefully. Consistently, Olumide Onadipe is building a substantial body of work with a well-defined artistic identity easily recognizable in the growing panorama of contemporary sculpture in Nigeria. “Connecting the dots” is another step forward. I hope not to miss the next one. A couple of weeks ago, Wura Natasha Ogunji and Raoul da Silva opened a join exhibition, organized and curated by Sandra Obiago, at Temple Muse in Victoria Island. The exhibition is still open till de end of April. The works that Wura and Raoul present to us in this exhibition couldn’t be farther from the shallow exoticism that still pervades large sectors of African contemporary art more than twenty five years since “The magiciens de la terre” (1989) and “Africa explores” (1991) exhibitions. 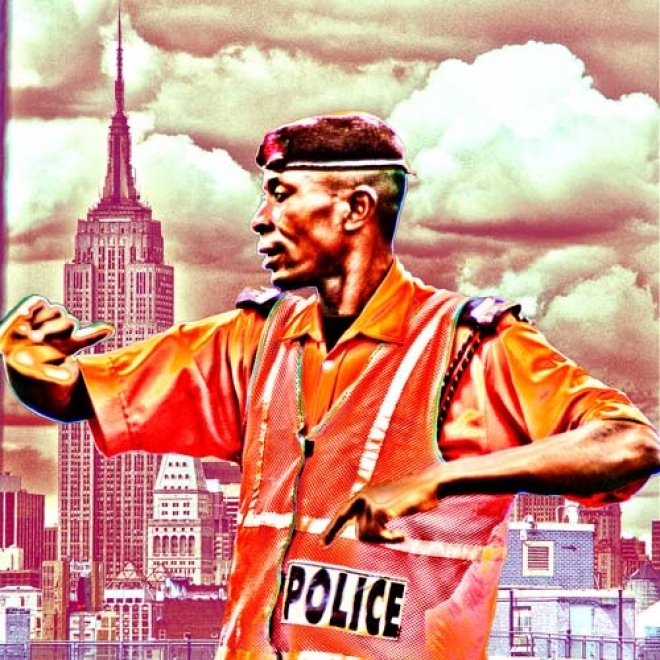 Definitely, neither Wura nor Raoul’s artistic practice is based on these tired clichés, on shifting artistic fashions or, much less, on the dictates and fads of the market. For Raoul, spontaneity, improvisation and the primacy of the gestural brushstrokes are central to his practice. In marked contrast, Wura’s approach is more analytical and rational. But, both are giving us something that comes from inside. Wura and Raoul’s works are intensely personal, albeit strongly different. Wura was born in the USA and lived there till just a few years ago. Raoul lived his early years in Lagos but left the country at a very young age and did not settle back in Nigeria till also a few years ago. The fact that both of them have spent most of their lives outside Nigeria and both of them are of mixed parentage has made their artworks to be inextricably linked to their existential journeys. Their artistic itineraries have significant differences and this fact is reflected in their works. In them, it would seem as if Wura is trying to understand herself, while Raoul tries to express himself. Wura’s works are not loud. They don’t shout at us, but they are works of unapologetic beauty and simplicity. Part of the reason why her small pieces on tracing paper work so well is the delicate, intimate, careful attention given to detail. She treats the fragile materials with respect and there is quality in each finished piece. The bright colour-rich inks on the translucent paper are subtle and restrained. The ordinary sowing thread becomes in her hands a metaphor of connections, of links, of relations, both physical and immaterial. The threadwork could have remained simply a craft, but it becomes much more. In this exhibition, Wura presents a few works in which only geometric compositions can be seen. In their conceptualism, at first glance they appear as inexpressive, cold and detached, but it is the colour and, specially, the physical fragility of the medium that brings them to life. They stand out in way that the geometric constructions of Mondrian, for all their compositional perfection, are not able to achieve. The lines that delimit the coloured areas have always a focal point and, therefore, they indicate a direction. As a result, the surface of the pictorial plane on which they appear loses two-dimensionality and suggests tree-dimensional space. The fact that the flimsy paper is affected by the ink pigments makes the flat, weak surface become slightly uneven and adds a new suggestive layer of complexity. The hardness and precision of the lines is balanced by the lightness of the paper. She explains: I use tracing paper, the kind that architects use for preliminary drawings. I love the way the thread looks against it and the way the large sheets of paper move against the wall. It can appear fragile but it also has a weight to it. When I’m working on the drawings, especially when I’m sewing into the paper and because of its translucency, it feels quite filmic, as if I’m creating one cell of a filmstrip. We can talk about the meanings of the paper, but for me, it’s about a simple love of the material. This sentence offers perhaps a key to understand Wura’s works: “a simple love of the material”. But there is more than materiality and geometric composition. The frequent presence of the “Ife head” is an iconic figure that recurs in her works. It brings with it associations of the past, of tradition, of roots, of identities. But even if it is just a tenuous thread or a few lines and colour bands emanating from it as rays, the “Ife Head” is a metaphor for a link, a line of communication between different, but interrelated realities. And all this, said with softness, in an understated way. 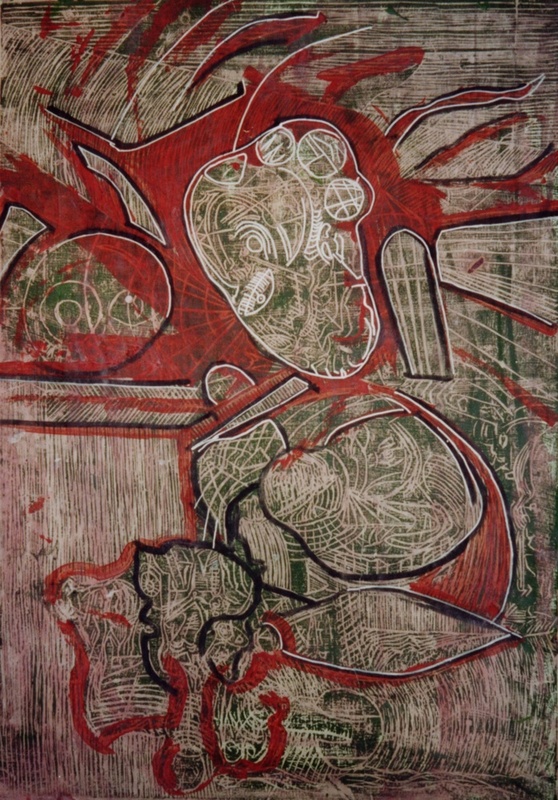 This fragility is one of the main strengths of Wura’s works on tracing paper. For years, there has been a recurrent concern in Wura’s works about connections, communications and associations, particularly, the transatlantic bond between Africa and the American diaspora. 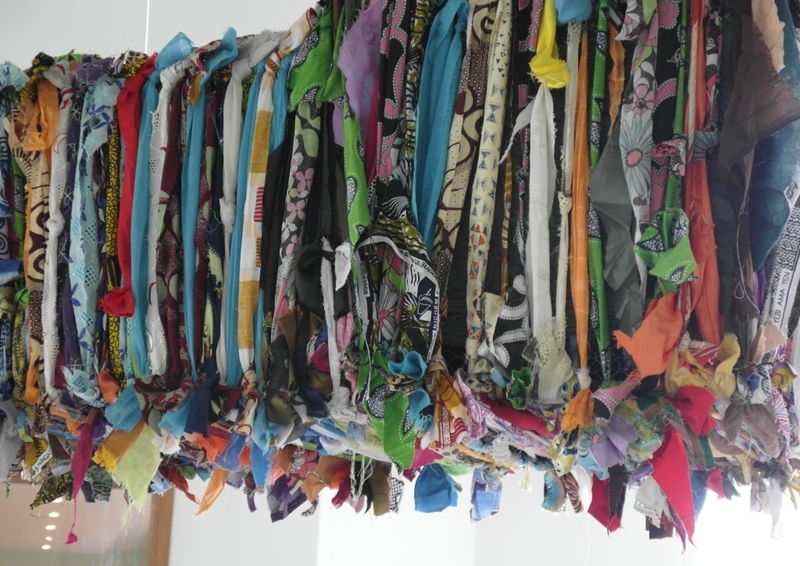 Her work “I brought you this”, in two pieces, with the Ife head on one, and a female figure in the other, both of them tied by a fragile bond of colour rays, exemplifies these concerns and successfully embodies these ideas into a physical form. Who brings what, to whom? In which direction is the communication? Does the “Ife head” –and all it represents- say something to the present, or is the direction of communication the other way, with the contemporary figure listening to what the past has to say?. 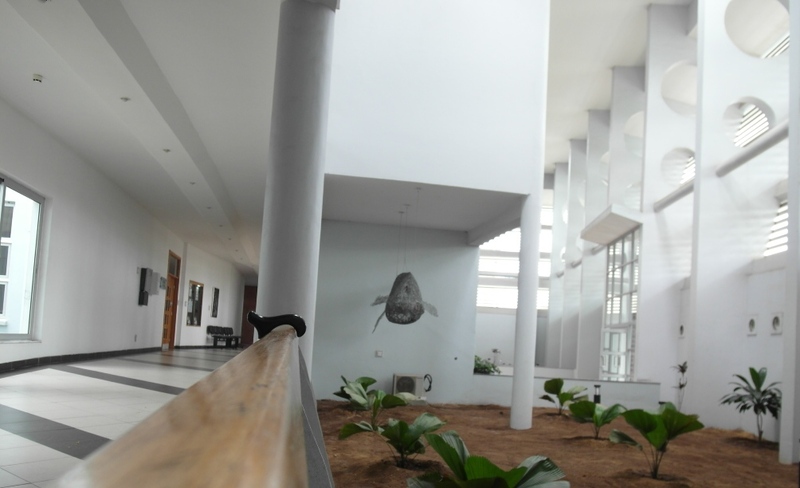 Wura´s works are ambiguously open. Can we take Wura’s subtle references to history, memory, tradition and identity as an attempt to understand herself and help us understand ourselves in our specific cultural, temporal and geographic circumstances? There is no doubt, that her works question us. 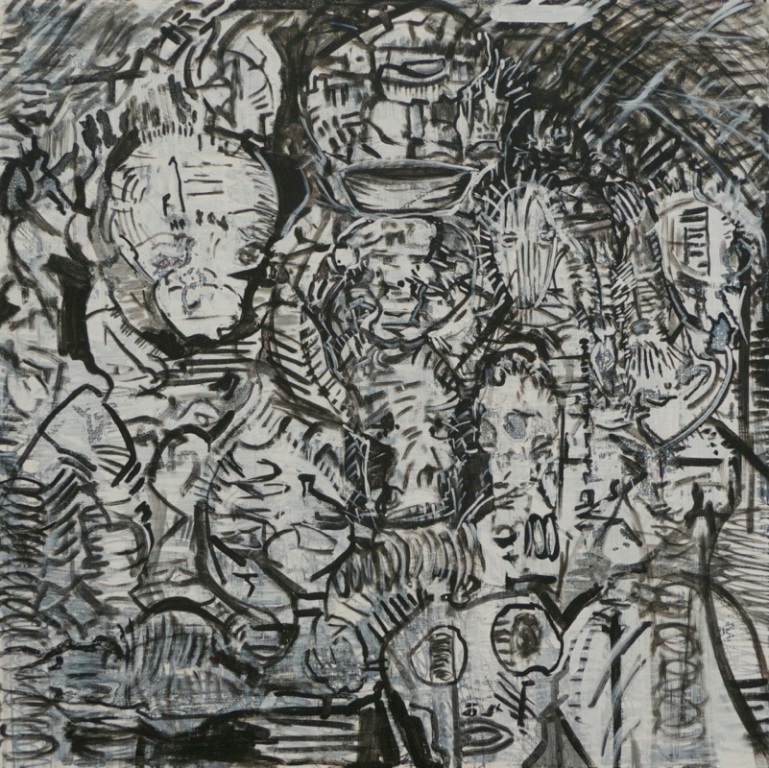 Though not directly influenced by them, Raoul’s works, with their forceful brushstrokes and the spontaneous approach to the painting process, have many features in common with the great German Neo-expressionist and gestural tradition of the second half of the 20th century: Gerhard Ritcher, Georg Baselitz, Anselm Kiefer, Jorg Immendorf. Markus Lupertz. Like most of these artists, Raoul looks inward for the sources of his works. Memories and instinct are important for him. The content, the subject matter, the communicative value of his works, generally matters less than the works themselves. The source of Raoul’s inspiration is intensely personal. He is an artist working within an expressionist tradition and method: spontaneity, expression, improvisation and gestural action are important in his works. The process of interaction with the pigments and the canvas is central to his way of painting. Each painting, each drawing, is “revelatory” of inner forces, desires and memories. As he says: in my way of working, the intuitive and impulsive work together as well as against the rational, reflective and explorative side, which helps to bring that balance. In the moments of outbursts, pouring out, and coming from the feeling, it’s having that trust and faith that all these memories, which are very abstract and not specific, but even just in the color choice comes from memories which I choose not to pinpoint or overanalyze. Raoul’s works develop from inside out. Their formal strength comes from within. That’s why they are so unmistakably personal. To look at Raoul’s works the spectator does not need to be distracted by a search for meaning, contextualization or conceptual justifications. These are works to be “enjoyed”, rather than to be “comprehended”. His paintings oscillate from decidedly abstract compositions to those filled with expressive biomorphic references, but they seldom try to offer a window into the world as all the traditional western art did for centuries. They are self-referential. There is randomness in his “coffee” works, in which the unpredictability of the shapes is part of the process. For Raoul, the significance of the process is at the core of his works. His colours, lines, stains and forms cover the whole space. In contrast, Wura lets the delicate architectural drafting paper, of subdued yellow tint, take most of the pictorial space. Her figures, made of stitched lines and colour, float in space while Raoul’s works fill the canvas with an outpouring of gestures coming from within. Different as these two artists are, there is a shared sincerity and genuineness in them. Their works offer a rare opportunity for us to experience art that goes beyond the merely retinal and decorative. They engage our senses, but they also engage our minds. In the commercialized atmosphere of the Lagos artworld this is not a small achievement. We are grateful for that. Nsukka’s influence is unmistakable. The best of those who have passed by that Fine Arts Department show a confidence, a focus and an understanding of art within contemporary discourses rarely seen in graduates from other institutions. 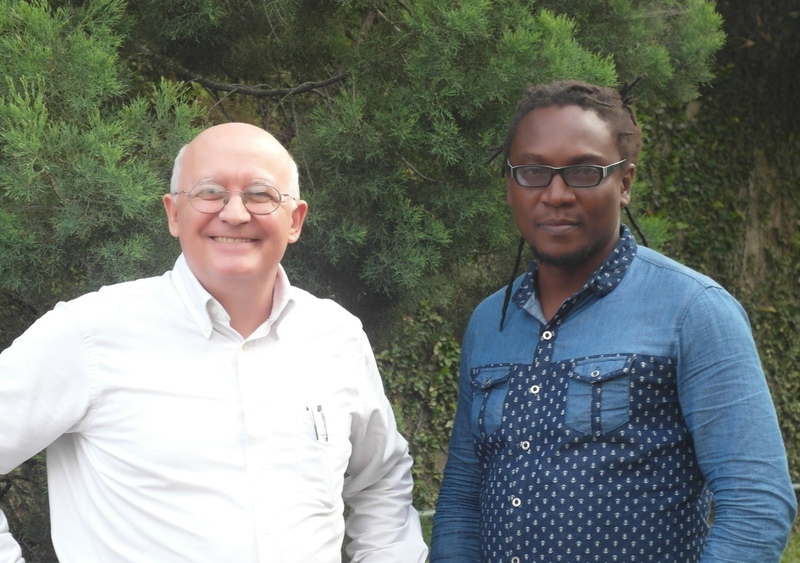 A few days ago I had the chance of expending some time with one of them: Ikechukwu Francis Okoronkwo, or Ike Francis, as he prefers to be called. We have known for a good number of years and, when we meet, we always have a good chat. Though he did his first degree in art at Port-Harcourt (1995), the years of his Masters (2001) at Nsukka had a determining influence on his approach to art making and his understanding of the role and place of the artist in society. 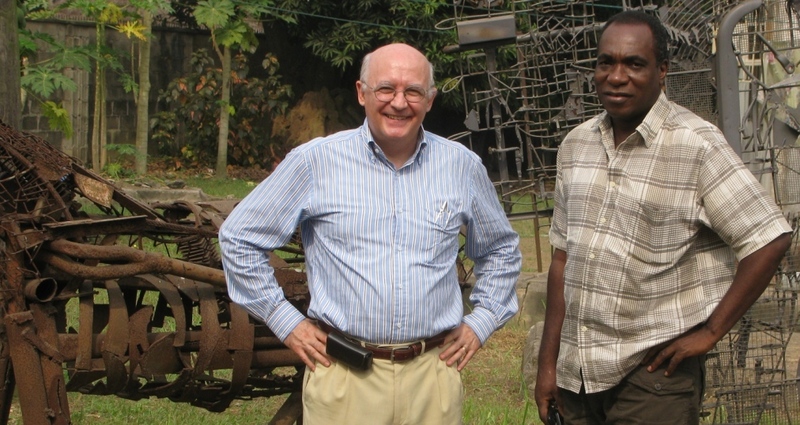 Like many others who had the opportunity of listening to and learning from El Anatsui, Chike Aniakor, Ola Oloidi and the rest at Nsukka, his work has been, for years, centred on issues, materials and society. Like a good number of his contemporaries at Nsukka he interested in the use of waste as material for his artistic experimentation. He is now working on a series of works that have as their focal point the Internet and the relations it generates. 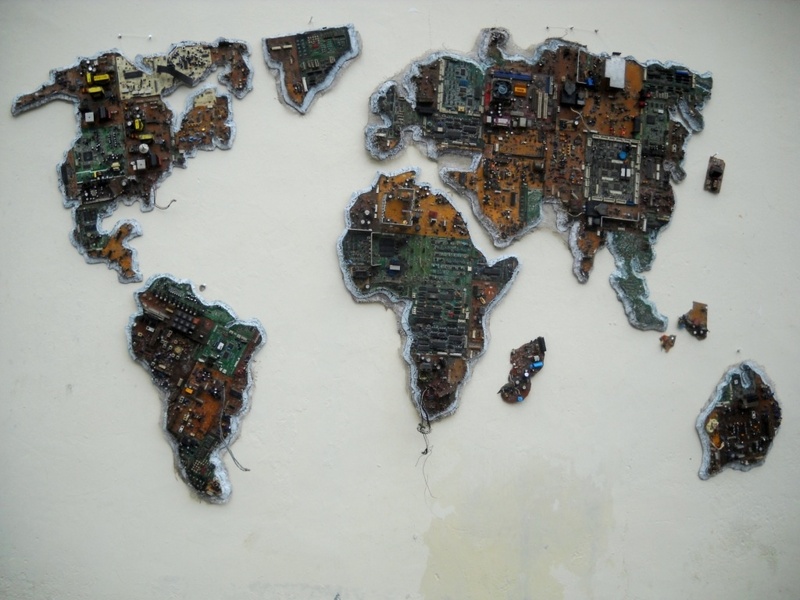 For almost a decade, he has been using motherboards, circuits and pieces from discarded computers and other electronic devices, incorporating them into two dimensional “pictorial” compositions or -more recently- using them as building blocks for fully three dimensional pieces. There is big difference between his recent works and the ones I saw at Dak’Art four years ago. 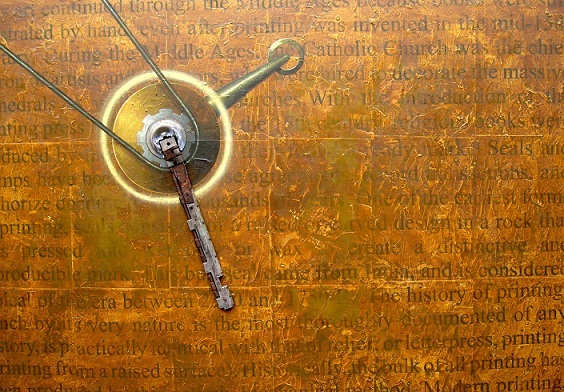 Painting on canvas has gradually disappeared and mixed media has almost completely taken over. 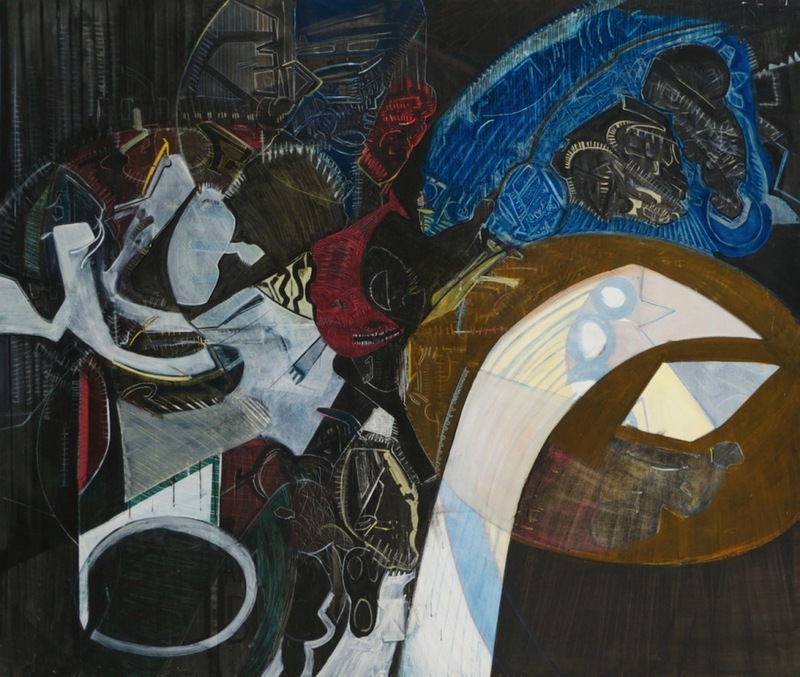 But his four-piece work, “universal man” still uses pigments, lines and shapes that work as a pictorial vehicle for his concerns about man and society. Since 2008 Ike is a lecturer at the Fine Arts and Design Department of the University of Port-Harcourt. Presently, he teaches three subjects: painting, drawing and mixed media. Being a lecturer and confronting students on a regular bases forces him to vocalize ideas and articulate thoughts. He is, definitely, quite adept at “explaining” his works, even if, at times, they do not fully succeed in embodying concepts.I say that, at times, they do not succeed, but it is remarkable that, often, they do. 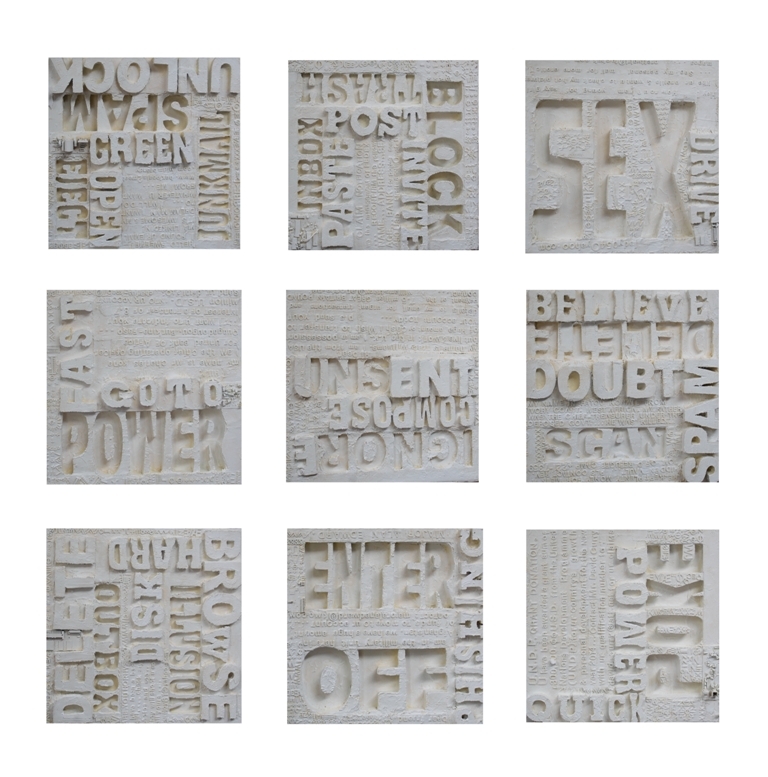 His use of stencilled letters is not as sharp and punchy as in Christopher Wool’s works, but they are able to communicate quite effectively. Few other artists in Nigeria can match him in this approach to art. Two pieces attracted particularly my attention: “Of Black Mail and Black Boxes”, a work made of three square panels and nine hanging cubes, mostly black with some silvery hues and, especially, his installation titled “Power Tale” made of three polycarbonate boxes containing high relief idealized representations of three cities: New York, Dakar and Lagos. While the work “Blank mails”, with its references to spam messages and unwanted mails marketing the unmarketable, is a clear and obvious piece, “Of Black Mails and Black Boxes” is a dark one, and not only because of the colour covering the reliefs; the chunks of coal, the barely legible references to fraud emails, the computer circuitry succeed in bringing to mind how technology can also be an instrument for dehumanizing activities. Ike Francis had tried the black charcoal before, but the results had not been so successful. 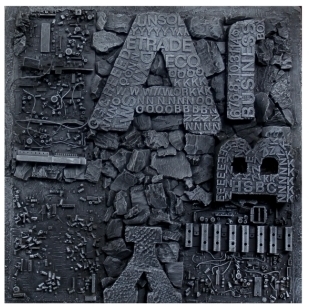 The symbols of letters and numbers –with their rigidity and rationality- have a dominant presence that balances the organic and casual character of the coal, the randomly scattered electronic parts and the other small blocks that fill the piece; and all this, within the constricted confines of small square panels (just 60 x 60 cm). Even without the addition of the hanging cubes, the three panels successfully tell a story. I asked Ike to tell me more about his interest on the internet and its impact of the lives of peoples the world over. He referred me to something he had written recently: My work is primarily inspired by the changes spurred by computer centered information technologies. Today, the Internet is a cultural tool that has had great impact in the mobility of our global culture. New breakthroughs in information technology have precipitated an unprecedented chain of events. Among these is the mass participation of people in an emerging global culture as mediated through information technology, primarily the Internet. New technologies have generally affected human expressions, including art. Artists seizing the inexhaustible possibilities available in new media continue to create new works reflecting the attitudinal change and shifting paradigms. The world-wide-web and the information disseminating from it have become common sources of inspiration and central agents of change, resulting in the re-negotiation of our global futures. 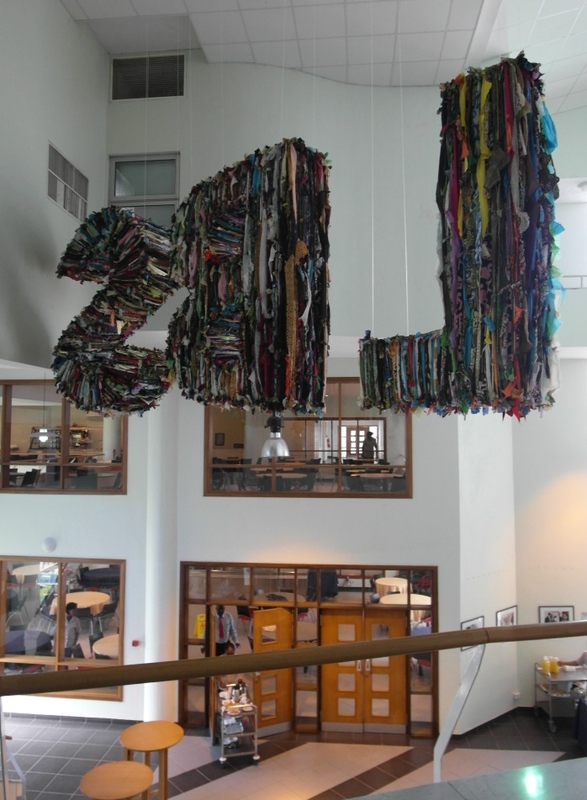 My work sets out to shed light on the appropriations and re contextualizations of used and discarded information technology materials, as metaphor for the fluxes of our present global culture. The work on which Ike Francis has invested a greater deal of time and emotional input is his installation “Power Tale”. Three glass cubes containing idealized representations of three cities. 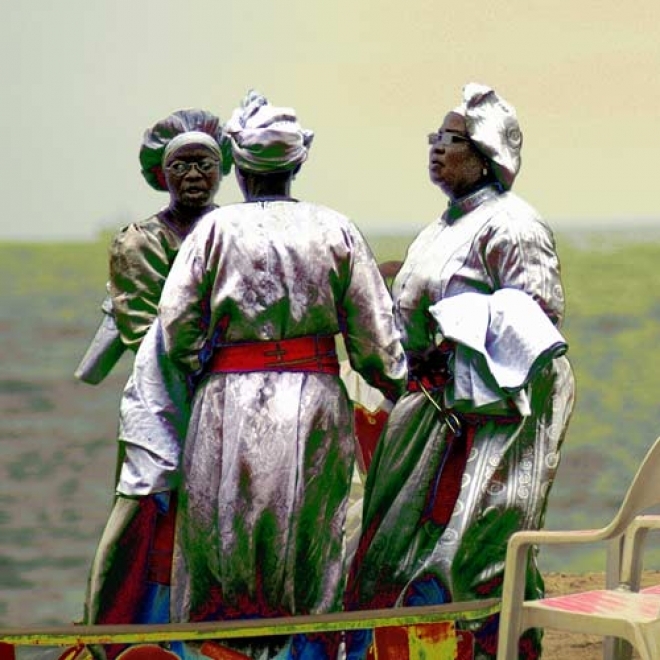 Each of them with anonymous, repetitive building blocks made of circuitry and each of them with an emblematic building or monument that identifies them: The Statue of Liberty in New York, the Monument to the African Renaissance in Dakar and the National Theatre in Lagos. The three icons stand out among the amorphous city layouts. They work as markers and they have a clear historical and cultural significance within their locations. This is not just pretty formalism. These works talk to the eye, but above all, they talk to the mind. They interpellate the viewer. Ike explains how the Statue of Liberty and the Renaissance monument point upwards, towards the future, while the National Theatre in Lagos, is horizontal, static. 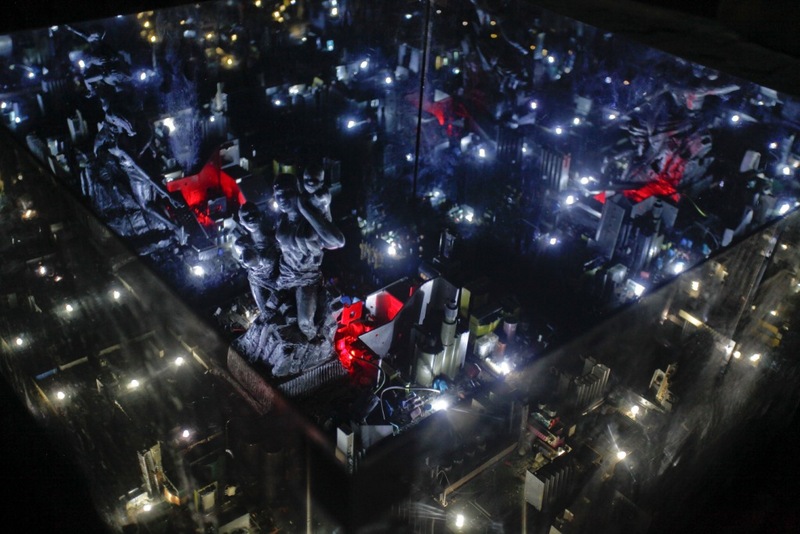 The introduction of tiny LED lights adds a new dimension to the work. Those in New York are densely distributed reaching all corners of the box; in Dakar they are more thinly present. In Lagos there are only a few of them and, unlike in the boxes for New York and Dakar, the lights go on and off. This treatment of the problem of unsteady power supply in Lagos might be a little oversimplified, clichéd and literal, but definitely, it works well in this installation as a device to convey meaning without words. The fact that the works are encased in highly reflective glass boxes multiplies the visual effect and de-materializes the physical components of the piece. 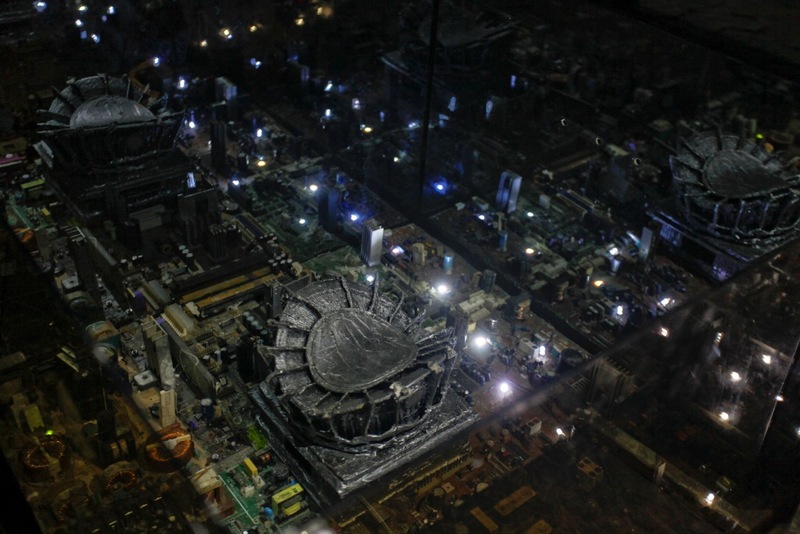 In the darkness, the motherboards, circuit panels and electronic junk become something else: skyscrapers, massive building blocks, densely stacked apartment buildings. There is a pervading illusion of perspective and distance. This is a piece that could equally be understood and enjoyed by an untutored child or a detached intellectual. It shows as a toy or a metaphor depending on the onlooker. It admits a multiplicity of readings. These works will form part of his coming exhibition in Lagos. I am already looking forward to it. Seven years ago, I was invited for an exhibition at the National Museum, Onikan by an artist unknown to me at that time: Raoul Olawale da Silva. It was a good thing I decided to “risk” and visit the show. Surely, I was not the only one among the visitors that felt excited in front of Raoul’s works. 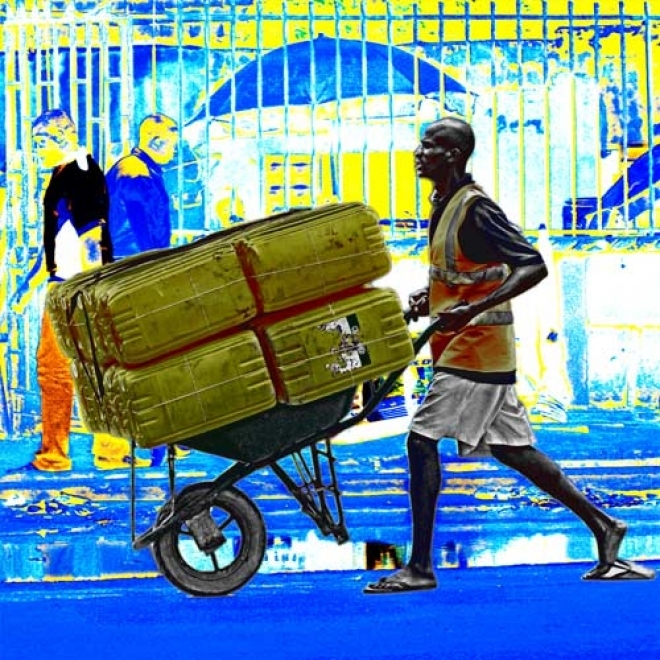 The exhibition goer in Lagos –and there are a few regulars, out there- is rarely confronted with works of such intensity and character. Without knowing the artist, his background or his artistic trajectory I was immediately struck by the works before my eyes. 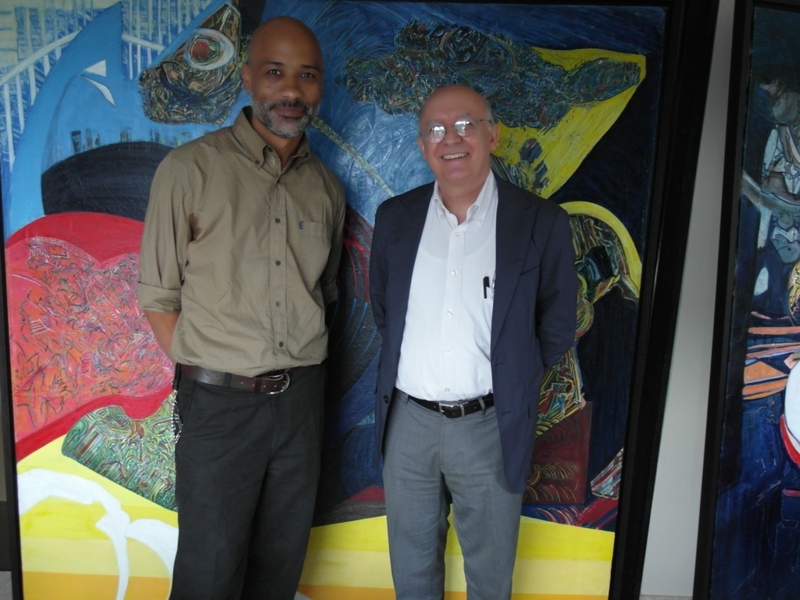 Just two years ago, when I was exploring some contemporary art collections in Lagos, I visited Agatha da Silva –Raoul’s mother- and was able to see in her house a good number of works left behind by Raoul. This time the experience was more intimate, deeper. These works -some of them uncompleted- were challenging me. I could not remain indifferent in front of them. 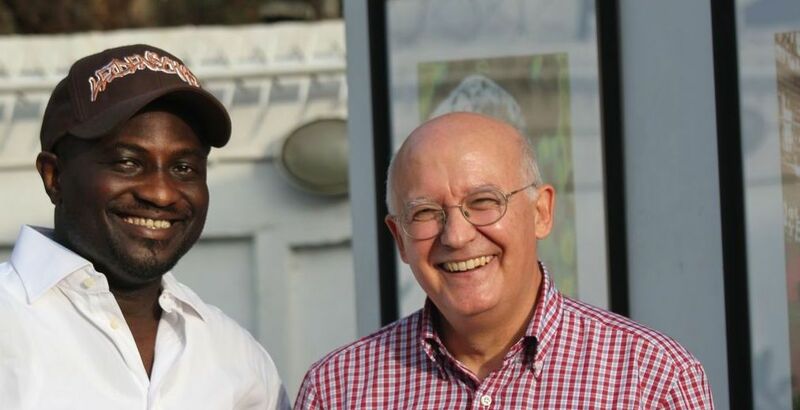 A couple of months ago, thanks to the good efforts of Sandra Obiago and –of course- Agatha da Silva, we were fortunate to have him back in Lagos -the city he left in 1981, when he was just 12 years old- for another exhibition. Raoul is a complex and intensely independent artist. His rich personal history is, no doubt, marked by the fact of having a Nigerian father (a Neurosurgeon from a well known Brazilian-Lagosian family) and a Swiss mother. His is a multifaceted creativity finding expression through different media: painting, photography, craftsmanship, music. Perhaps, I should add skateboarding, an activity he considers a true –though ephemeral- form of art. He is passionate about it: “I am street skater for more than 20 years now. Skateboards, boarding is an art and an art form always crossing borders and boundaries, influencing and being influenced, always developing and staying young for the young state of mind. Maybe just like dance or Asian martial arts, it is a most direct and sincere forms of expression”. It is difficult to fit Raoul’s works into a neat, clearly defined artistic pigeon hole, to associate them to a recognizable name or qualifier. But, perhaps this search for “sincere forms of expression” provides the key to access the paintings, drawings and installations in this exhibition. 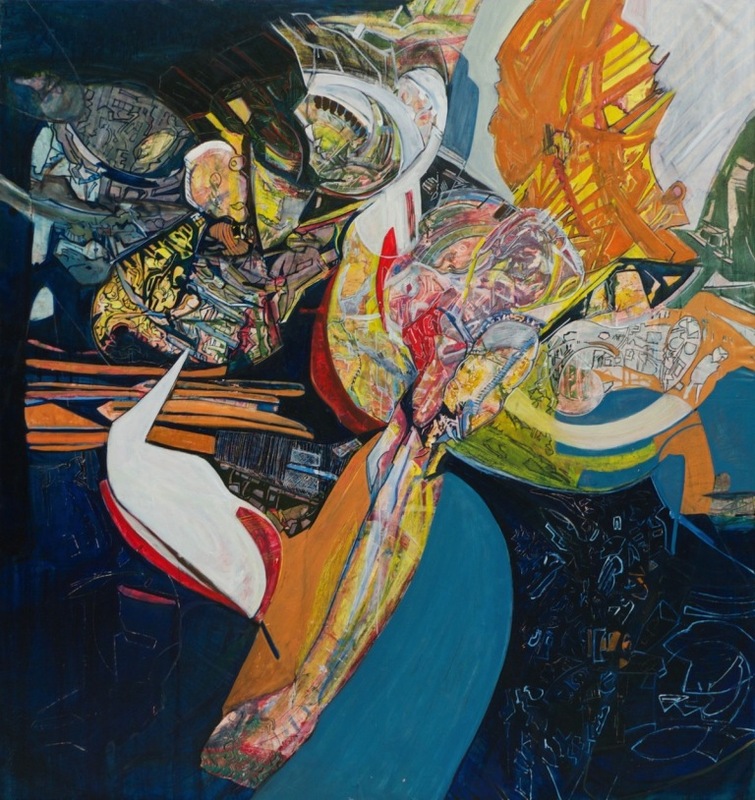 His works appear as an externalization, an “expression” of a many-sided personal world. And in this process of expressing -of bringing out- inner realities, spontaneity plays a central role. This is the way he explains how he starts a new work: “I start from somewhere deep within almost on a subconscious level letting the canvas or working surface to get stained or “randomly” marked, trusting that there is enough material inside me to work with that will come to show an idea or at least a route I can follow… This process is being repeated over and over till I feel I have something that can evolve into meaning for me. Then I try to transport/transform that aesthetic to a plane where I now sharply observe and act and react to what is going on on the surface and around it. Taking off, scratching off, peeling off paint and then putting on, slapping on, dripping on, brushing on paint till a harmony or dissonance starts to create tension which is a sign that I am on the right path”. More than 60 years ago, the critic Harold Rosenberg coined the expression “action painting”. 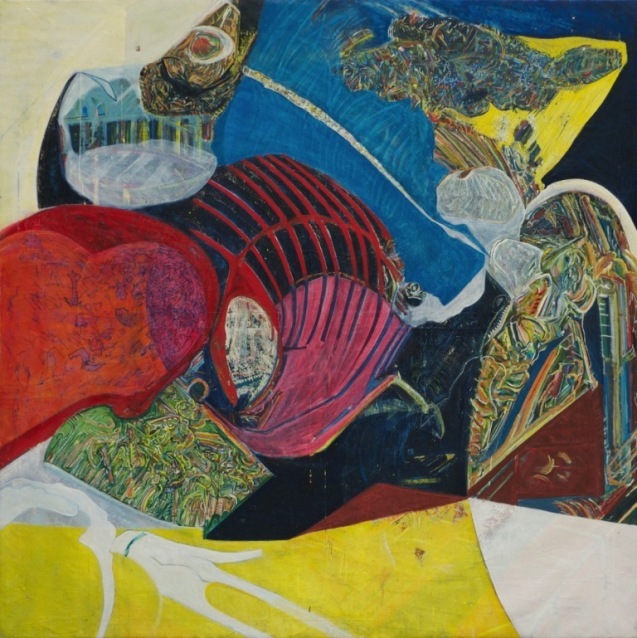 He wrote in his well known essay of 1952, “The American action painters”: “At a certain moment the canvas began to appear to one American painter after another as an arena in which to act — rather than as a space in which to reproduce, redesign, analyse or ‘express’ an object, actual or imagined. What was to go on the canvas was not a picture but an event. The painter no longer approached his easel with an image in his mind; he went up to it with material in his hand to do something to that other piece of material in front of him. The image would be the result of this encounter”. Rosenberg’s expression “an arena in which to paint”, seems particularly apt to refer to most of Raoul da Silva’s works. In this exhibition Raoul juxtaposes works produced over a span of ten years (2003-2013). This allows the viewer appreciate the continuity and evolution of his oeuvre. Two formal elements call immediately our attention. First, there has been a progressive increase in the size of the works. The use of larger canvases (some of them over 2.00 meters wide) shows a much more self-confident artist, not afraid to face increasingly challenging works. Second, the “painterly” works of ten years ago, with their blurred contours, broken shapes and overlaid colours, have evolved into pieces in which lines and boundaries are more defined and prominent than in earlier works, when gestural brushstrokes had pre-eminence. The organic, fluid, dream-like creatures have given way to more defined shapes taken from the real world. 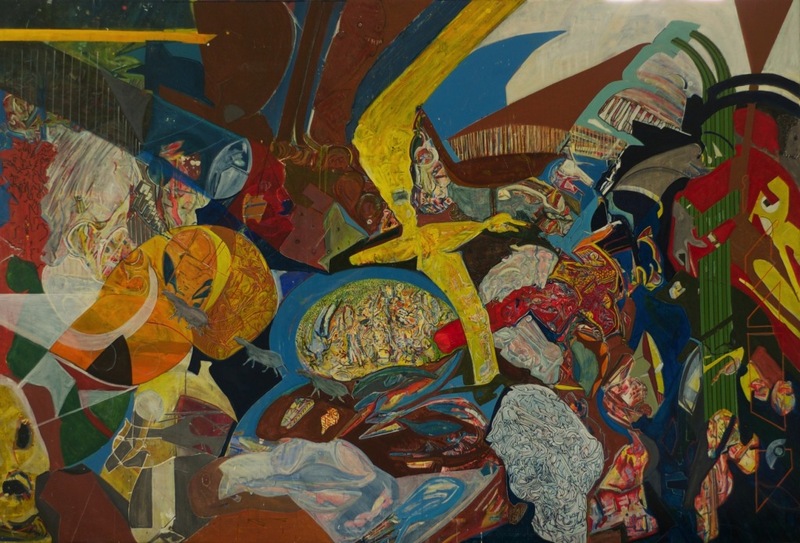 While some of these older works brought to mind references to Osogbo artists (specially, Twins Seven Seven), or to de Kooning and Pollock, the recent ones are more akin to the explorations of Basquiat, Bacon or Ritcher. In addition, there is a more subtle development: these new works engage the outside world in a much more distinct and direct way than the older ones. For instance, the insertion of four telephone handsets in one of the 2013 works would have been totally out of place in the ones produced ten years earlier. It seems there is a gradual shift from works emerging from an “inner”, self-referential universe to a messier, more real world. But despite the development of his artistic identity, Raoul’s works still grow from inside out. Their strength -and they are undoubtedly, strong- continues coming from within. Perhaps, that is the reason why they are so intensely personal. Like with good music, or with dance, the viewer is not encumbered by the demands of meaning, rationality and context. His works need not to be “understood”, but to be enjoyed, letting them tell each of us a different story. This is an exhibition to enjoy quietly. Raoul da Silva is allowing us a view of a personal, intimate, suggestive world of great formal beauty. This is a privilege rarely available. I am glad not to have missed the opening. The works are on display till August, 15. I might go to see them again. George and Uche belong to the same generation. Born in 1972 and 1973 respectively, they are good friends and they have more than a few things in common. 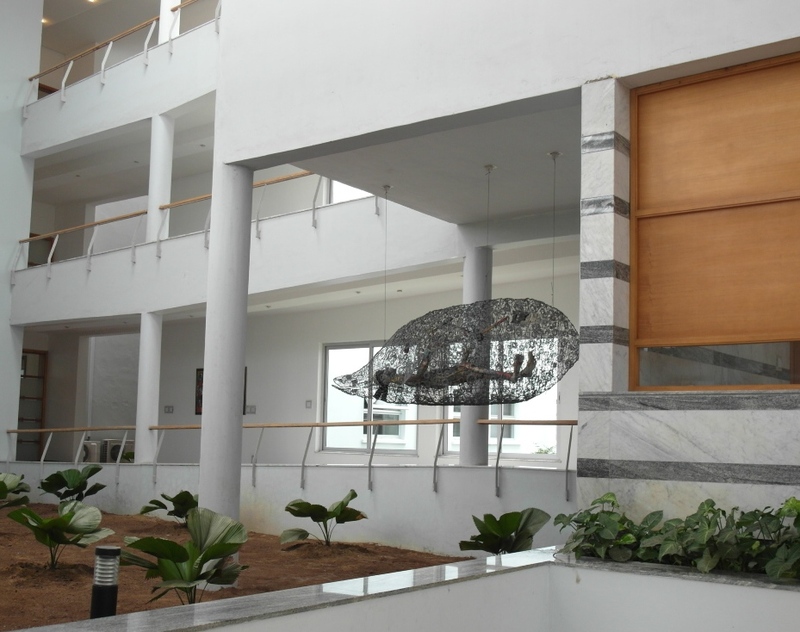 Now, they have one more: the last two additions to the growing contemporary art collection at Lagos Business School are works produced and placed “in situ” by them. 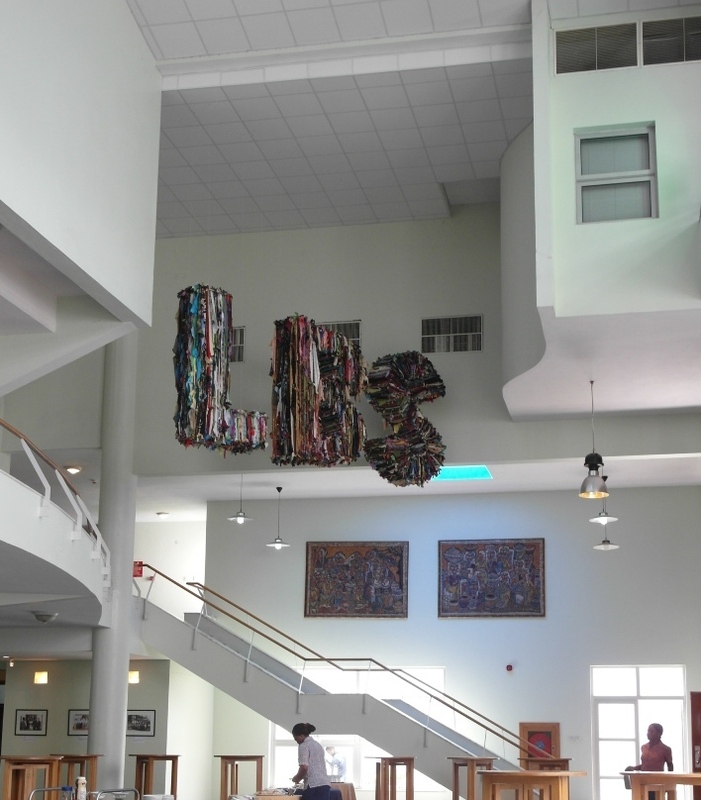 Both pieces, Peters’ “Free yourself” and Edozie’s “LBS” can be seen, suspended from the ceiling, in public areas of the LBS buildings at Ajah, Lagos. 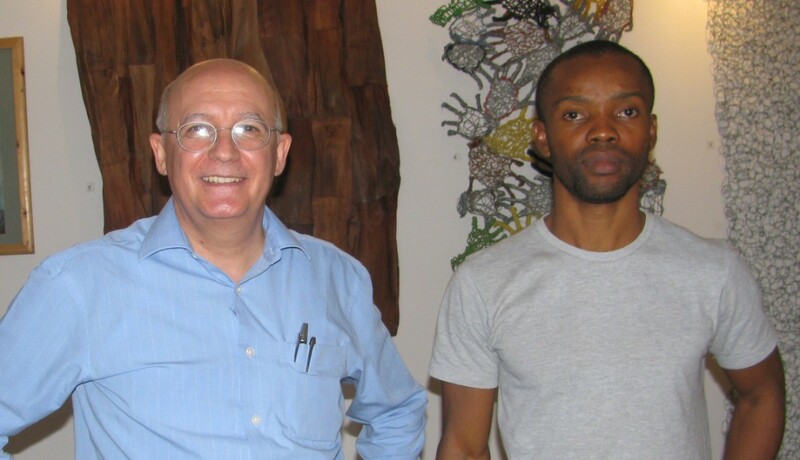 In 2009 I helped putting together an exhibition at Omenka Gallery titled: Nigerian abstract painting now. George Edozie and Uche Peters (at that time his name was still Uche Igwe) participated in it. 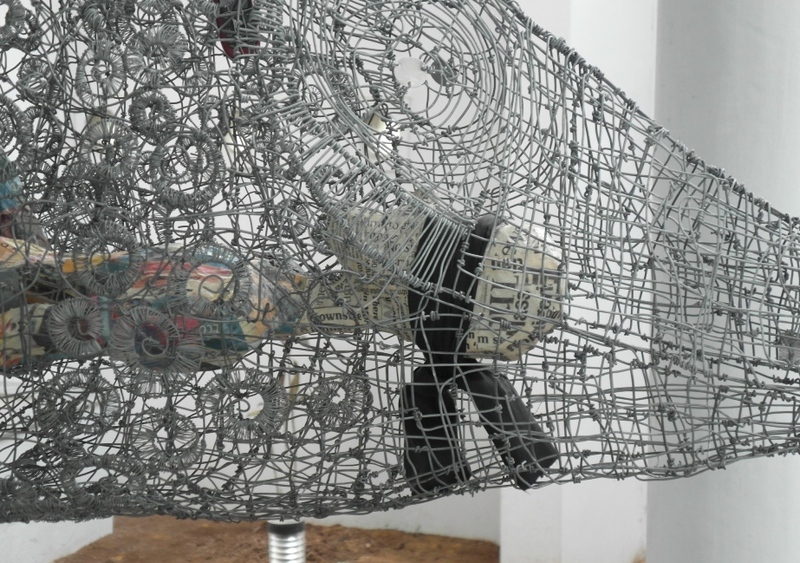 Since then, Uche has produced only a few works, mainly using galvanized steel wire, while George has been a prolific artist, increasingly incorporating textiles into his works. Uche is an unusual artist. He did not study art; he does not earn a living through art, he is not a member of any professional art body, but there is no doubt about his being an artist. His works prove it, even if some art bureaucrats might disagree, adducing that he is not one, because he is not “registered” somewhere. He has experimented with wire sculptures for the last five years. He “crochets” and twists the thin galvanized steel wire into two-dimensional “fabrics” that he then uses to create three-dimensional works. Since he runs a catering business that takes most of his time, producing one of these sculptures requires of him months of work. 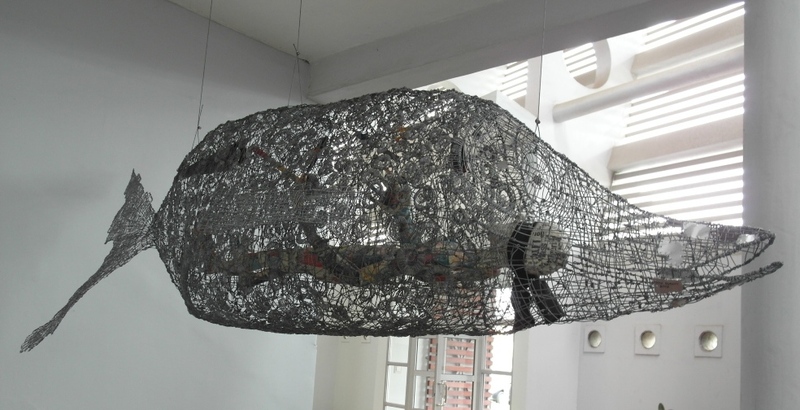 Uche’s works have little to do with the ubiquitous wire sculptures sold at tourist markets all over southern Africa. He is not interested in producing tourist crafts, but he is an excellent craftsman. As he does not use soldering for his work, the cold joining method forces him to “bound” the wires around themselves. This is heavy, physical work, but the end result is excellent. The wires are beautifully intertwined creating works of delicate complexity. But there is much more than skill and hard work. 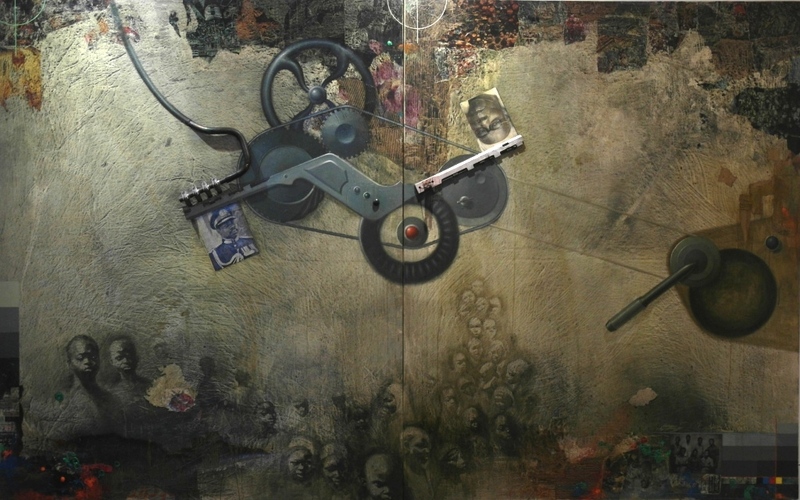 Each of his pieces explores issues, questions assumptions, and engages the viewer on a discourse. 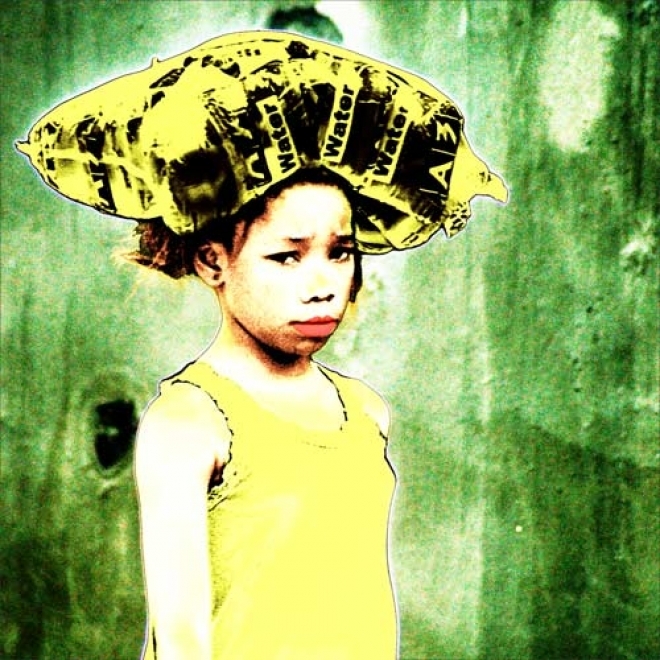 Uche has a great ability to “embody”, to materialize ideas into physical art works. In this case, the underlying narrative is about freedom and about the sad capacity we human beings have of creating self-imposed boundaries made of fears. The human body enclosed in the wire fish has his/her eyes bound. He can’t see that the tools to free himself are close at hand, because, also within the belly of the fish, there is a mallet, a saw, a pair of pliers, a phone and a knife. If the hopeless figure were to remove the cloth from his eyes, he would be able to use these tools to free himself… This is a powerful metaphor, delicately crafted into an arresting piece. 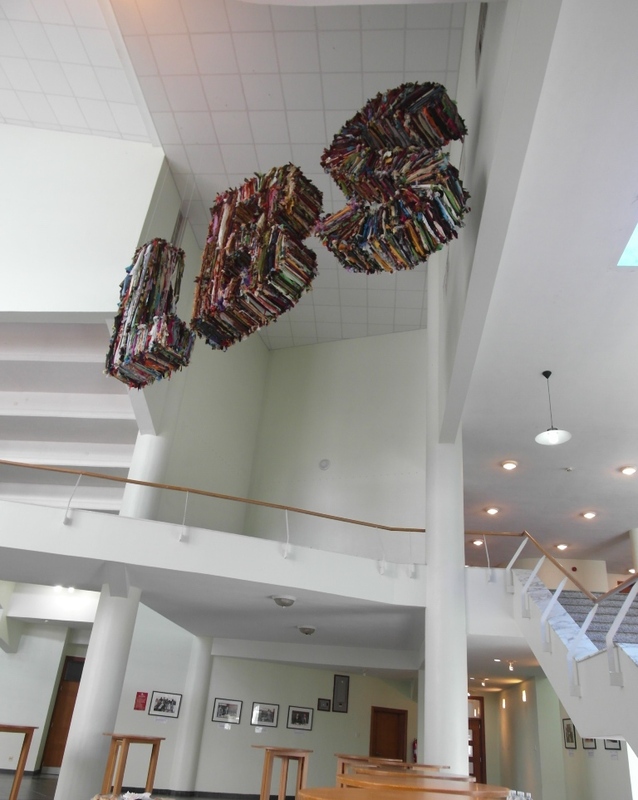 The other new artwork at LBS is also a suspended “sculpture”. 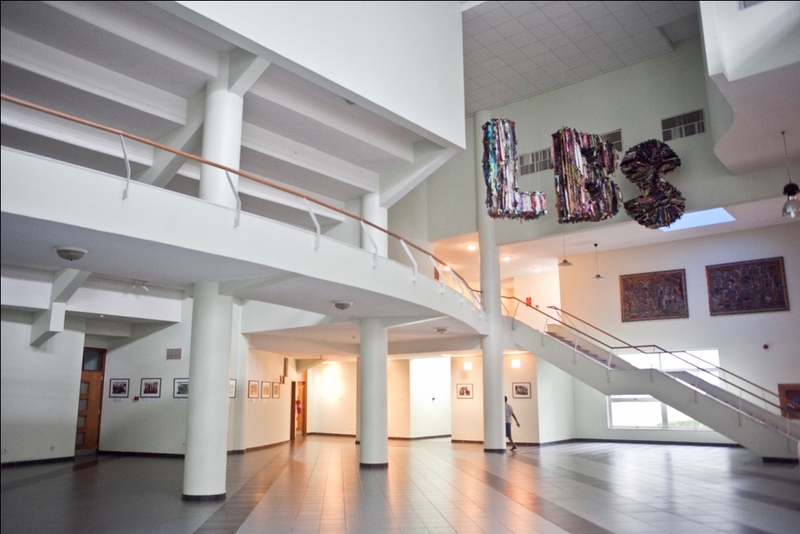 Produced and mounted in-situ by George Edozie, in the main foyer of the School, this is a suitable piece for the large, high-ceilinged, bright space. George trained as a painter and has always worked as a painter. It shows in the way he has treated this tri-dimensional piece. In his paintings on canvas he normally applies raw colours on the cloth and works them with the knife. 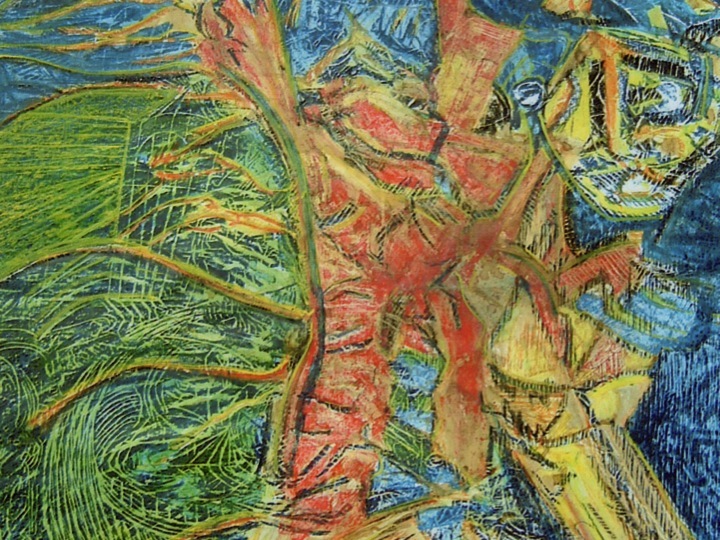 The play between surface, colour and texture is central to his work. In the LBS letters, it is as if the “canvas” had been wrapped around the steel frame that supports the letters. His work is two-dimensional even when the surface is not. In this sense, his work is “superficial”, and with this word I do not suggest that it lacks depth. It is simply that he works on the surface of a tri-dimensional object, as if he had done it first on two dimensions and then enveloped the letters, like a flat cloth covering a body and taking its shape. He is still a painter that has “painted” these letters not with brushstrokes but with shreds of cloth… This piece is not “moulded”, this is a piece “covered”. It shows that this is not the work of a sculptor, but the work of a painter, and, again, I say it not pejoratively. In this work George decided to arrange the cloths in vertical shreds. This is a subtle and successful choice. From the distance at which the piece is seen, the cloth is not “read” as cloth, but as an aggregation of multicoloured, vertical “scales”. The central place given to “surface” is clear, but the volumetric, spatial quality of the work can’t be dismissed. The “body” is not fully hidden under the “cloth” that covers it. The sheer size of the letters (more than 2.00 meters high) plus the tension created by the dialectic between large volume and “floating” suspension are also at the centre of the success of this work. 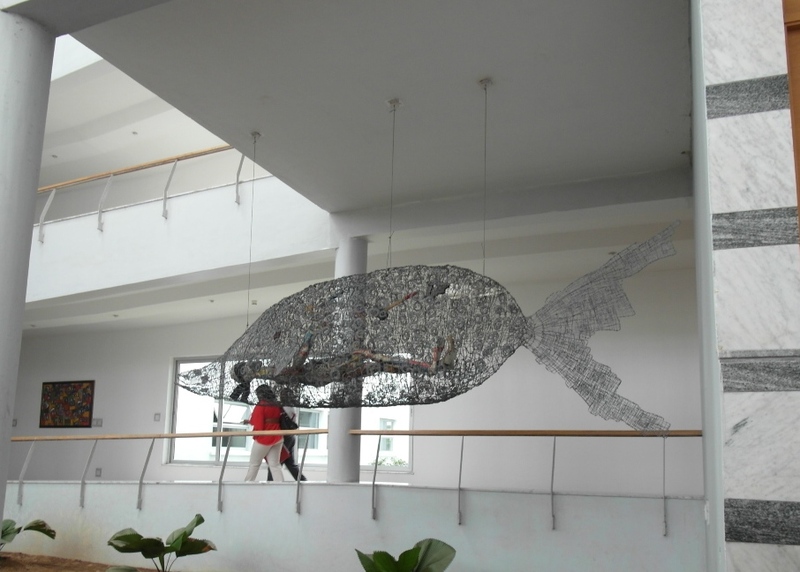 Lagos Business School has taken a risk with these two artworks. Perhaps they will not be appreciated by everybody; the detractors will continue asking the old question: but, is this art? I do not know whether it is or it not, but I think LBS has done the right thing risking a little and going beyond the conventional. I hope they continue inviting many other artists to surprise, inspire and challenge us with their works. George Edozie and Uche Peters have done so quite creditably. Congratulations to them (and to LBS). Ade is a sharp observer. 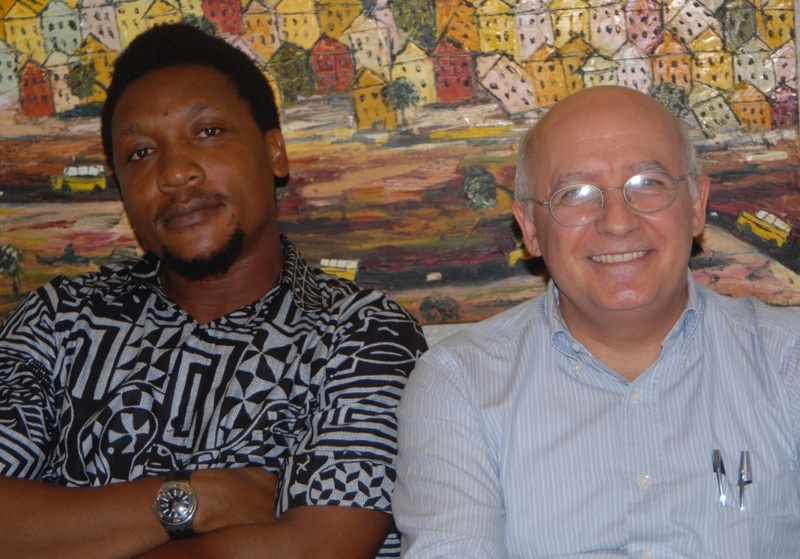 Since he came back to Nigeria in 2005, after almost 25 years away, he has looked with empathy at this unique micro world that is Lagos. Finally, he has put into words and images a very personal portrait of the city. A few days ago, Ade mounted an exhibition titled “Icons of a metropolis”, accompanied by a book and an excellent web site. I was lucky to visit it twice. 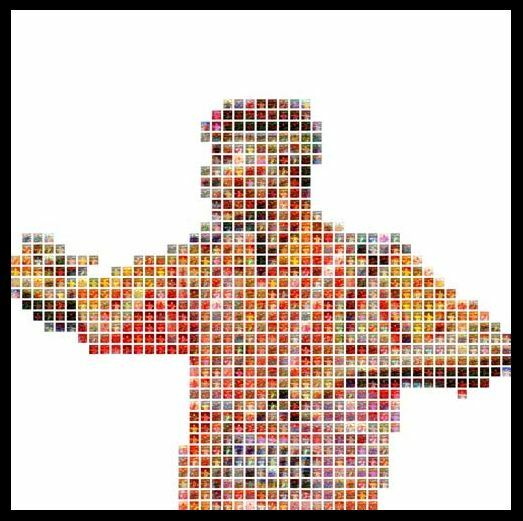 First, he has identified twenty “icons”. He could have selected places, wares or objects, but he has focused, almost exclusively, on people. As he says: “Icons of a Metropolis” offers a non-judgmental look at 20 character archetypes – they are the ICONS. They are a creative force, a self-organizing and self-referential manifestation of the zenith of urban survival. The ICONs add colour, help to reflect our consciences, test our moral compasses and above all offer signals to the fragile points of the rapidly expanding ecosystem of a megacity. In their guise as evolutionary change agents they can be considered as the city planner’s guide or muse and as such are living mentors on the design requirements for mega cities”. These are his twenty icons: the cart pusher, the beggar, the load carrier, the street hawker, the opportunist, the scrap man, the traffic policeman, the thirst quencher, the masquerade, the molue, the okada, the water peddler, the oil scavenger, the praise crier, the prayer warriors, the sand dredger, the displaced, the child bride, the challenger, the load carrier. We all know them, and we take them mostly for granted. Despite their ever-presence, they remain invisible, impersonal, but they make this city what it is. Individually, they dissolve in the urban fabric. Together, these icons “create” an urban fabric. They sustain the identity of this living assemblage of flesh, concrete, steel and blood. Ade, unveils that identity. Taken separately, each of these “icons” tells us a personal story. Together, they give the story of the metropolis. Exit Ade, the social anthropologist. Enter Ade, the social archivist. He has photographed these “icons” and made them visible. But documentary photography is only the raw matter for his work. His images are more philosophically ambitious than most of what we are accustomed to: Ajegunle, the markets, Makoko, the oil spills, etc. Referring to his artworks, he says: “(they) seek to tease the mind and invite viewers to engage, as a means of reflecting on their own lives and that of the society in which they live“. I think this is an apt observation. Exit Ade the “documenter”, the archivist. Enter Ade, the artist-craftsman. He does not present to the watcher an aseptic, realistic view of the icons. 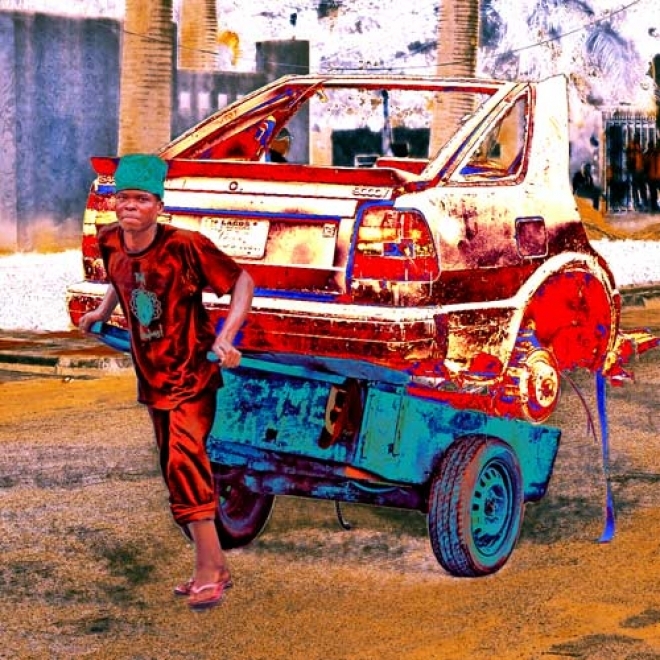 He has processed these raw images, manipulating colours and hues, contrast and saturation. Undoubtedly, Ade is extremely skilled in the use of image processing software, but he has not stopped here. 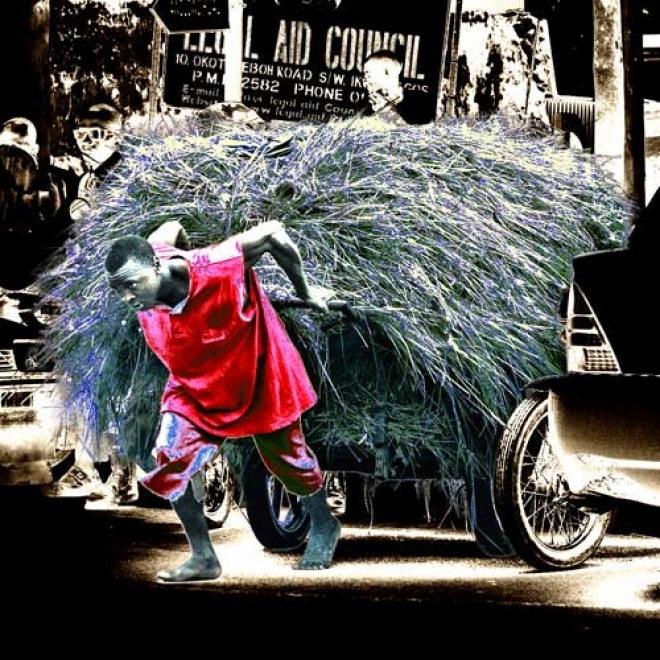 The processing of the images enables Ade to give them a new life, conferring them a layer of disconnection from the realities they portray. 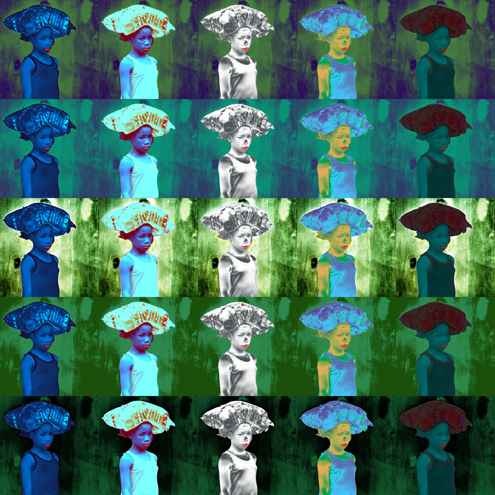 Uncoupling from reality is accentuated by his use of solarization and colour shift processes. This is particularly successful in the photographs in which he plays with complementary colours: red on green, blue on yellow. In addition, by “detaching” the foreground from the background and playing with them in multiple combinations, he transforms a single image in a series of images. Exit Ade, the computer craftsman. Enter Ade, the artist-creator. Producing the individually processed images is the beginning of a compositional work. The brief essay that accompanies the exhibition is succinctly titled: Repetition. This is the key word to his compositional strategy. In his words: “Repetition, whether it be visual, verbal, or cognitive creates conditions for new meaning by placing the old (that which is repeated) in a new context of an expanded range of considerations. Conceptually, repetition is powerful; it creates infinite combinations from finite elements – just as the ICONs create infinite possibilities from limited choices. He is passionate when he says that, through repetition, he would like his photographs to “go beyond a visual record of something we have experienced and become the source of a new experience. To become art”. The art year is closing in Lagos. The auctions are over, few exhibitions are planned for the remainder of the year and artists, dealers and collectors are already thinking of their Christmas holidays. 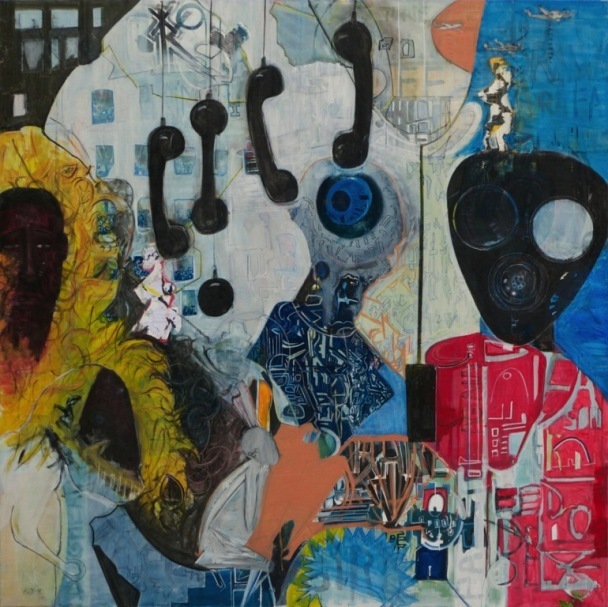 And then, unexpectedly, Kelani Abass and Omenka Gallery give us a Christmas present: the exhibition “Man and Machine”. It has been only four years since Kelani graduated at Yabatech as the best painting student, but in this short period of time he has moved from a conventional, stereotypical mode of representation, to an intimate, highly personal body of work. He seems to have left behind the market scenes, the skilful depiction of motor parks and road sides, and delved into the creation of an imaginary world where man and machine take the whole space. He has moved from merely re-presenting the surrounding environment, and particularly people, to enquire about issues, both personal and societal. That is why a purely formal analysis of his new works would be insufficient. Looking exclusively at their formal properties would not be enough. These works can be “read” at different levels. I met Kelani in the morning hours, when only he and I were at the gallery. This allowed me the chance of listening to him without hurry and getting a better understanding of the background and genesis of this exhibition. He explained to me how the thread linking these recent works is the industrial printing process and the machines used to make it possible. His late father had a printing press and he spent countless hours there. Even before leaving primary school he was already involved in the preparation of artworks for the printing jobs. By the time he left for Yabatech, he was conversant with the mechanical processes involved in printing. And this was before the arrival of “offset printing” or digital imaging!. As he says in the exhibition catalogue: “it is fascinating to observe the way machines operate as different parts to achieve a common goal. This informs my thinking and my ideas, and thus inspires my art in this direction”. He is especially interested in the wheels, as central elements in industrial machines. The influences are still discernible. 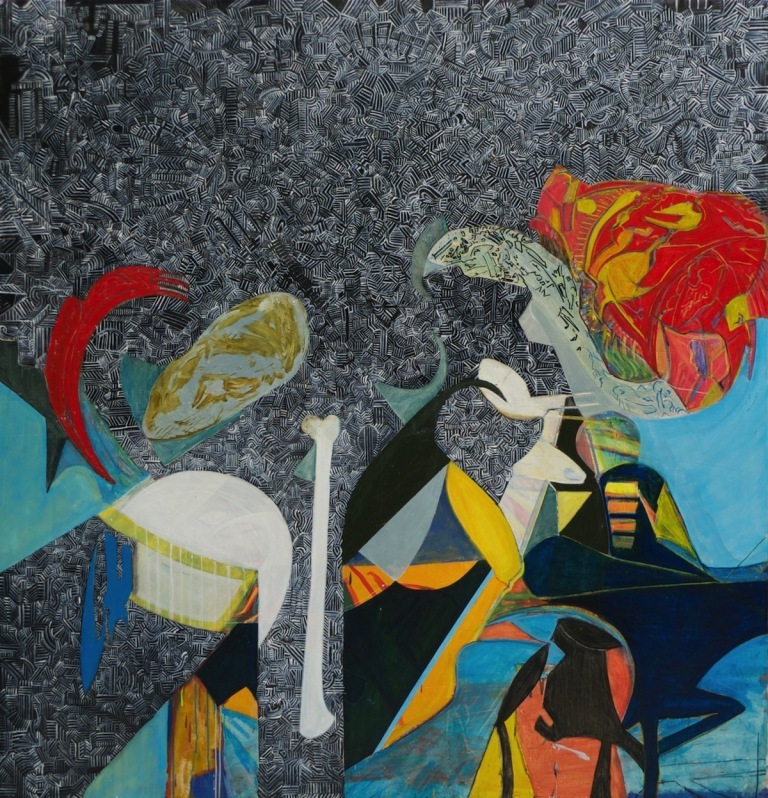 The way he works the textures and the materiality of his canvasses brings to mind some of abstract works of Kolade Oshinowo, his teacher at Yabatech. 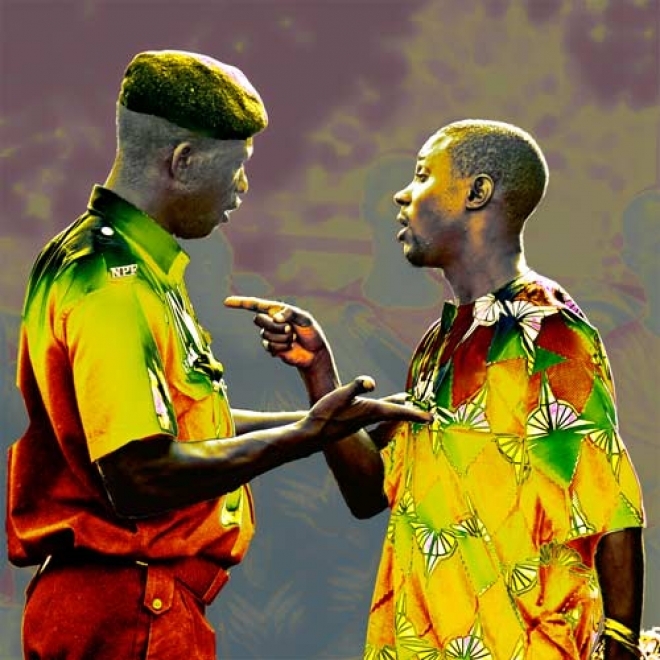 The freedom with which he approaches them echoes the ways proposed by Mike Omoighe. These works go beyond the easy realism. They are more in line with neo-expressionist experiments. 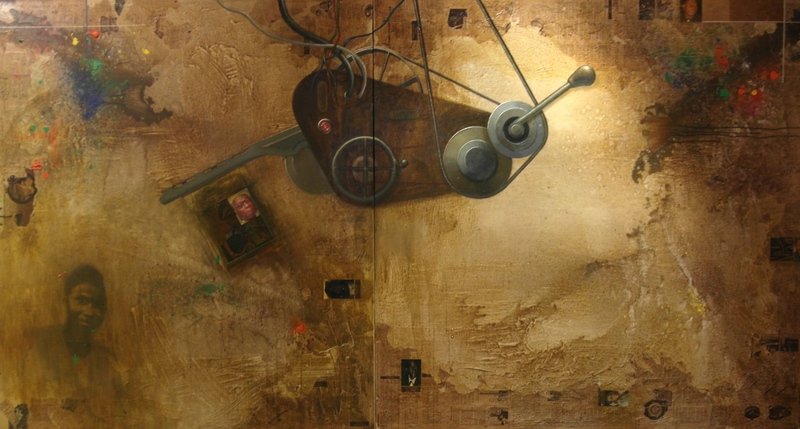 There is in them a mixture of abstract backgrounds with superimposed figurative elements and applied objects. 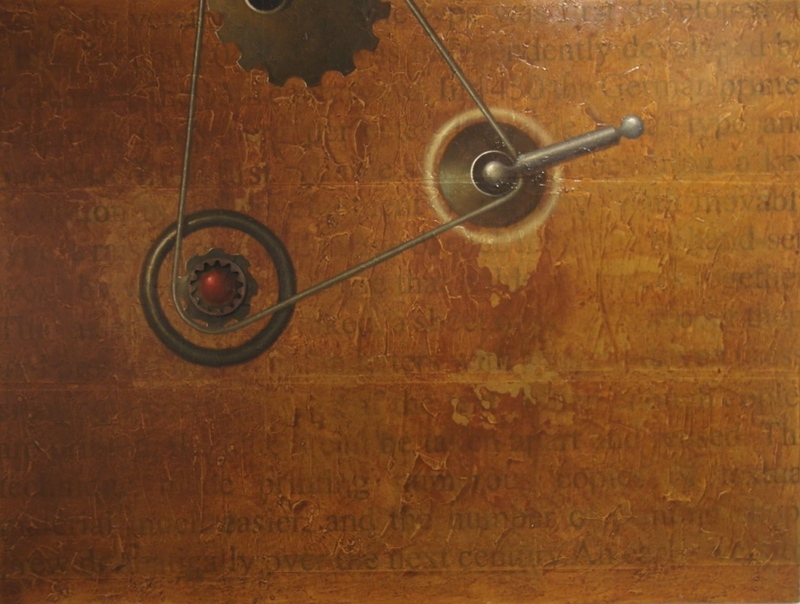 The play between real and drawn mechanical elements is particularly successful. And this makes me think of the way aesthetic and non-aesthetic (or should I say, visual and non-visual) properties interplay in the best samples of traditional and contemporary art. These works are beautiful to the eyes, but there is more than what the eyes see. There is something only the mind can apprehend, and it is this “something” that puts these works above the usual stuff. There is restrain and these works and there is “soul”. They radiate warmth that is not only the result of the subdued and earthy ochres and greys. This is a personal story, and the canvasses abound in subtle personal references, like the insertion of a small photographic plate in which Kelani’s father appears. But he also transcends the personal and the intimate; the numerous references to political and societal leaders also show an artist going beyond “his” art. This is uncommon and this is encouraging. It seems, there is life after the market places, the motor parks and the other “genres” so sought after by tourists and nouveau rich. It is always heartening to come across artworks of this quality. I am glad I did not miss this exhibition. I am already looking forward to the next one.